p.s. - keep up the awesome work! HOW in the world do you DO this?! I can barely do my own makeup NORMALLY, let alone something with this amount of detail! So amazing! Please tell me which link you used to buy colored mascara! I miss mine, and I can't find it anywhere! Wow, such vibrant colors! Very nice. 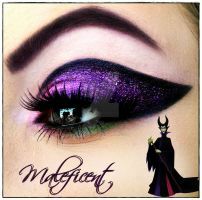 reminds me of the look of the maleficent designer doll! You are good with make-up. Also, I like the yellow contacts. That's some really cool colours! Well done. Wow! I already knew it was maleficent before i saw the title so awesome job! Nicely done! It really does bring Maleficent to mind when I see this. Wow.. amazing!! I love it!! Gorgeous! Can I ask you what you use to make designs on your lids?